This post was contributed by Darren Worley – many thanks! On page f57v of the Voynich manuscript, in the bottom right hand corner, an unusual symbol can be found. In this short report I suggest a possible identification and its purpose. I also describe a mid-15th century manuscript containing many other examples of this symbol. Several Voynich manuscript researchers in the past have noted and suggested possible meanings for this symbol, but no comparable examples have been identified. Hopefully, by identifying other examples of this symbol a better understanding of the early history of the Voynich manuscript can be established. In the bottom-right hand corner on the final page of each quire an ordinal abbreviation mark can be found. These Latin ordinal abbreviations (first, second, third etc.) identify the order of the quires that comprise the Voynich manuscript. These quire marks can easily be navigated to, and seen, using the excellent Voynich Manuscript Voyager website. In addition, a symbol can also be found on f57v, also in the bottom-right hand corner. It looks like a loosely-drawn lower-case letter ‘y’ with a horizontal line drawn above. It seems probable that this symbol also serves a similar function to the quire marks, namely, identifying a sub-division or sub-section of the manuscript. I propose that this symbol is an unusual, or early form the pilcrow, a typographical character for marking individual paragraphs. In the medieval period a rubricator would add this symbol to passages of text to identify individual sections. Originally, I thought the f57v symbol might have been an unusual form of the “capitulum”, a symbol that marks a new section or chapter in a passage of text. However, in the manuscript described below, chapters are identified differently, suggesting that the pilcrow and capitulum were written as distinct symbols, each having specific meaning and purpose. I have found near-identical examples of this symbol in a Bohemian hand-written New Testament Bible, dated to 1445-1465. It is written in the Czech language. Wherever this symbol appears in the margin it is accompanied by a red vertical stroke, within the text on the same line, indicating a division of the text. It is quite a small book, comparable in size to the VM (23,5 cm × 16cm). I have also noticed that this Bible contains marginalia which may also be in the same hand as the pilcrow symbols (eg 37v, 56v, 106v etc.). This might also provide further information about who added these annotations. It would also be interesting to identify any similarities between this marginalia and the extraneous writing found in the Voynich manuscript. I attach some comparison images below. I estimate that the manuscript contains over one hundred such examples. To date, this is the only manuscript I’ve found containing examples of this symbol. As there a very few Czech Bibles from this period, it may already have been the subject of academic study, so it maybe possible to learn more about its origin and history from published academic sources. I’m very sorry not to have seen this earlier. Congratulations on a fine piece of work. I rather think it deserves publication in a good journal. I hope you’ll consider doing that. LES 22 LETTRES HÉBRAÏQUES …première clef de Lecture! Ensuite Étude de la Page avec ce SYMBOLE de forme 5……seconde CLEF de Compréhension. Dans ce Livre …. 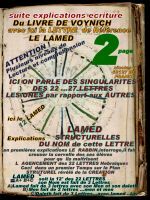 Deux pages sont les Clefs de Lecture de ce Livre d’enseignements Hébraïques de la TORAH. 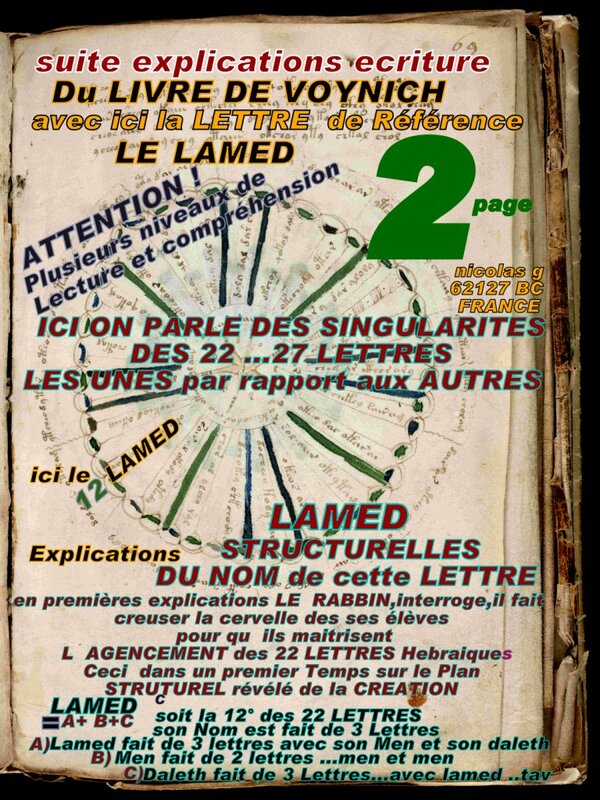 La Page 69…..qui explique LES SINGULARITÉS NUMÉRIQUES des 22 LETTRES HÉBRAÏQUES … Leurs Positionnement STRUCTURELS dans cet Alphabet. The strange symbol on f57v is not strange at all but one of these usual pilcrows that derived from a C-majuscule with a vertical stroke through the C. Along with the change of the writing during the centuries also the pilcrow (alinea) changed its form a little.The pilcrows we see in the Czech ms are typical for a Bohemian bastarda, the one of f57r would also fit very well into that writing as well as in the mixed bastarda of the VM. In the VM it is obvious that it indicates a complete new capitulum starting on f58r. The link below shows a lot of pilcrows from the “Sachsenspiegel” (Mscr60) in their earlier form. So, Darren, you are right with your idea, that the strange symbol might be a pilcrow, but it is absolutely not unusual. The example pointed out by Marco, on f24r, is interesting, because it occurs each time before the words: “bieda wam”. (This is not the case for the other pages). This is old Czech, and the modern spelling is: “Běda vám”. It belongs to Matthaeus 23. Each time, it is the beginning of a new verse, so I wonder if the symbol could mean something like: “incipit”. Alternatively, the Czech word for ‘new’ is novy, so the abbreviation could mean just that. (Modern Czech has an acute above the y, but these diacritics were not yet in use then). Thank you for this interesting suggestion, Rene! Koen pointed out the fact that this cosmological diagram appears on the verso of a folio presenting a botanical illustration on the recto. The symbol meaning “incipit” seems to me to fit well: it could mark the fact that a cosmological section begins in an anomalous position (the verso of a page). This folio is suspicious in many ways. Diane once remarked that the figures look as if they are drawn by a later hand and I’m inclined to agree. First of all, the recto side is a plant picture. Hence, I believe the verso must have been blank. The human figures look awkward, different from the standard nymph in many ways. The way the arms bend and attach to the body,the face of the one with the orb… the diagram itself is also unique with the amount of circles, and the glyphs and words are unusual as well. The most important observation is that one side of the sheet is a standard plant, while the other is not botanical and additionally deviates in all possible ways. Hence, taking into account Helmut’s comment on the meaning of the mystery glyph, I’d say that there are two possibilities. One, someone noticed that this page was out of the ordinary and maybe even did not belong and marked it. Two: someone used a rare blank side of a page in the middle of the MS to add this diagram, maybe experementing with glyphs and drawing nymphs. The reasons are hard to guess. He then marked the page at the bottom so he or others would know it’s not oroginal. Thank you for sharing this interesting finding, Darren! This blog post (by Thomas Sauvaget, I think) argues that the character could be a “g” and provides a good visual example. The author proposes that it could be “an abbreviation for the german word ‘Gebet’ (prayer, worship)”, but I don’t know how founded this idea is. Rene has discussed an isolated “g” (clearly in a different hand from the symbol in f57v) that appears in Voynich ms f1v. He convincingly interprets it as a colour annotation for grün / green, on the basis of very similar examples in Vicenza ms 362. Of course, this function can be excluded for the symbol in f57v, which appears in a large empty area. I find your interpretation of the symbol in the Bohemian manuscript plausible, but also Helmut’s idea seems interesting to me. For instance, in f24r the sign appears six times and there are pages in which it does not appear. Remains the interesting question what a quaerendum on VMs 57v means. I think it has been mentioned before that the text looks as if different parts were written at different times and I would venture the opinion that our VMs author had to look something up. Thanks Helmut – this is a plausible hypothesis. 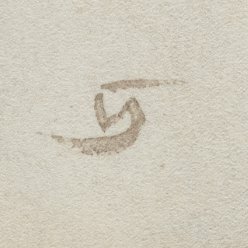 Do you know of any other manuscripts containing “quaerere” abbreviations? It would be useful to make direct comparisons, and interesting to know where and when this abbreviation was used elsewhere. The idea that it might indicate where a correction needs to be made, is interesting, especially as there are no (or few?) corrections in the VM. I am fairly certain that the quire marks (with the exception of the one on f57v) are a numbering of the quires using Arabic numerals like those used in the 15th century, with probably with a “q” (and sometimes another symbol) after each number. I suspect these marks were added by someone other than the creator after the manuscript was bound. It also looks like the manuscript was broken up and the quires were later re-assembled in a different order. … of course I take a moment to re-read what’s known about the manuscript, along with Darren’s post, and see that none of what I said was really new. The symbol does resemble the pilcrow from the Czech document, but the fact that there’s only one of them in the Voynich and that it’s separate from the rest of the text makes me think that it was added later. Hi Daniel – I agree, I think the general consensus is that the VM quire numbering, and this symbol were added afterwards (although probably quite early in its lifetime). However, I think, since the Czech Bible manuscript (to date) contains the only other good exemplars of this symbol (whatever it may ultimately be identified as), this may possibly provide a clue to when, and possibly where, the VM was bound into a book. In this case, in or around Prague in the mid 15th-century (of course this may change, depending on the results of future research). Lastly, its worth noting that this Czech Bible was part of the Clementinum library – a Jesuit college in Prague. Jacobus Horcický de Tepenec (Sinapius) (1575 – 1622), the VM’s first identified owner, studied and died at the Clementinum. When he died he left his manuscripts and library to the Clementinum in his will [please clarify, if not the case]. It would be interesting to know when it first entered the collection – the first reference I’ve found is in an 1849 catalogue but it probably entered much earlier. Regrettably, little is known about the family and early life of Jakub Horcický z Tepence (1575 – 1622), the first known owner of the VM. Pretty much all we know is that he was born to a lower-class family in Ceský Krumlov. However, I was curious to learn that his birth family-name (Horcický) is derived from the Czech word for “mustard” (horcice in modern Czech). The “z Tepence” was an honorary title received later in life. Since family surnames were often derived from occupations, nicknames or a place of residence, I was curious to know what “mustard” as a surname might signify. I don’t think this has been reported before. Interestingly, it has been suggested that “mustard” as a surname was originally occupational, for a dealer in spices; or perhaps a nickname for someone with a “hot temper”. So perhaps, Jakub Horcický’s family ancestors were dealers in spices. I thought this was of relevance, and might provide an explanation for why Horcický initially came to own the VM. Has any further research been done on Horcický’s genealogy? Is it known how long his family been resident in Ceský Krumlov, and where they may have lived prior? Although he entered a Jesuit college, did he have Jewish ancestry? With respect to his family name, Horcický is an adjective meaning ‘mustard-like’. He chose his Latin name ‘Sinapius’ because it also means mustard. Some copies of his book include a biography of him, and in this it is written that his name should be compared with his deeds. Referring to Matthew chapter 13 he was born as a tiny mustard seed, to blossom later as a tree. Bolton strongly relied on historical sources, in particular the work of Josef Svatek. One would have to read him to know if there’s anything to it. However, the accuracy of the work of Svatek is also a matter of debate today. However, while I undoubtedly recorded the source for this, I haven’t been able to find it back. Furthermore, he chose ‘de Tepenec’ as his noble predicate, and this refers to a hill with a castle a bit south-east of Moravian Sternberg. It is not known why. Horcicky knew Rudolf already in 1608. Not only did he receive his nobiliitation in that year, but he had actually written a letter to the emperor requesting this nobilitation. It would leave enough time for the alternate scenario, namely that he was actually the one selling (or giving) the Voynich MS to Rudolf. This possibility has been considered since many years, but there is no evidence either way. I’ve noticed that a digitized copy of the book that de Tepenecz’ authored, is now available online. Interestingly the annotations in this particular example show it was part of the Clementinum collection. This particular edition dates from 1609 (i.e. during his lifetime). Were any other editions printed during his lifetime? Are any other editions available online? This 1609 edition contains his insignia about 10-pages before the end. Although I don’t read Czech the frequent Biblical references shows he was someone well-versed in scripture. What do you take to be the possible significance of the symbol in that position, if it is this type of pilcrow? Why is it separate from the text, unlike the examples in the Czech manuscript? Any thoughts? Hi Stephen. Thanks for posting my report and for your comments. Since the only other close-examples of this symbol has, to date, been found in 15th-century Bohemian manuscripts, I think the significance of this symbol is that it suggests that the VM was likely bound in Bohemia. It seems reasonable to assume that the quire numbering and this symbol were added when the VM folios were bound into a book. Regarding the significance of its position on f57v, to answer this I think its necessary to find other examples. I have found another manuscript containing similar symbols – although they are somewhat smaller, they are fairly similar in-style and seem to serve the same function within the text. Interestingly, the symbol is found both in the margin and also within the text, indicating that its use is not just restricted to the margins (as in the VM). The manuscript is a 15th-century Bohemian version of the New Testament Epistles. As with the Bible manuscript, this was part of the Clementinum library (Jesuit College at St. Clement). It is heavily annotated throughout. It can be accessed here. 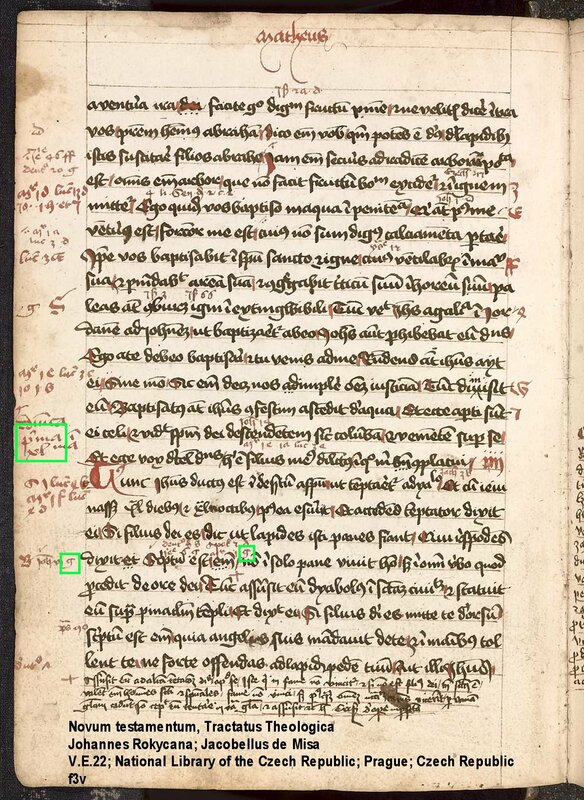 I attach an example image, of page 3v, with the relevant symbols marked (in green) – it can also be accessed here. You can also find other examples of this symbol within this margin, and elsewhere in the manuscript. I’ve also marked (in green) an abbreviation for primus (?) which is also in the margin. The first two character, in particular, share a close similariity with the VM first folio ordinal found on f8v.